DAVID W. MAPES, ISA CAPP has been a member of the INTERNATIONAL SOCIETY OF APPRAISERS (isa-appraisers.org) since 1984. DAVID MAPES testifies in courts of law as an EXPERT WITNESS. DAVID MAPES has performed thousands of appraisals and estimations of value since 1966. He was the instructor for a national course offered to professional appraisers through the International Society of Appraisers. 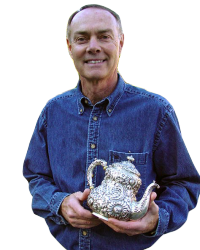 He speaks to many civic groups on antiques, collectibles and their values. CURIOUS ABOUT VALUES? Informal valuations are available FREE OF CHARGE at the auction gallery. Email us at mapesauction@gmail.com or give us a call at 607-754-9193.